What is the Leukemia Master Class? A must-attend, 2-day "immersion" advanced leukemia training program, taught by the top academic leukemia academic KOL experts. Please note: This Master Class is offered only once every two years, so please take advantage of the opportunity. It is specifically designed for pharmaceutical industry, biotech and laboratory testing/diagnostic company executives who want a comprehensive update on the numerous new and emerging leukemia therapies. This is particularly important because there is a very large number of and growing number of new and targeted and immune therapies, including FLT-3 and other novel and emerging targeted therapies, checkpoint inhibition, CAR-T cells and other immune strategies for the management of the major subtypes of leukemia. This is the first time in decades for data on new leukemia therapies. Because there is so much new and emerging clinical information, this 2018 Leukemia Master Class is an excellent 2-day intensive review for pharmaceutical industry, biotech and laboratory testing/diagnostic company executives, who wish to be completely up-to-date on the most important leukemias that are responding with significant clinical responses to therapy. And because this Leukemia Master Class is such a comprehensive review, a small number of practicing hematologists, Advanced Nurse Practitioners nurses and pharmacists outside of industry will also attend this Leukemia Master Class. They add to the learning dynamics. The standards of care today and emerging therapies are TOTALLY different than they were two years ago. This Leukemia Master Class benefits all attendees, but especially pharma, biotech and laboratory industry executives. This is now the 6th “Cancer Master Class for Pharmaceutical Executives.®“ taught by the Oncology Learning Center. Since 2016, hundreds of pharmaceutical industry, biotech and laboratory executives, as well as some community medical hematologists, oncologists, and other non-industry HCPs have attended these Master Classes. They have reported to us in their post-Master Class feedback that these 2-day “immersion Cancer Master Classes” were invaluable comprehensive reviews. They specifically stated that these 2-day Cancer Master Classes helped them “get up to speed” in just 2 days, versus 12 to 24 months or more. The feedback also stressed that it was quite valuable to learn the objective, unfiltered perspectives from the numerous academic Leukemia KOLs during their presentations and also on the Expert Panel Discussions and their perspectives on various treatment-related issues they addressed in the many Q & A Sessions. This 2018 Leukemia Master Class uses our proprietary, highly interactive learning format that helps all of the participants to remain closely and constantly engaged with the faculty throughout the entire 2-day program. Short and engaging 15-minute case-based presentations followed by Expert Panel Discussions and Q & A Sessions have been designed for optimal learning and to help learners meet with and establish their own personal relationships with the KOL academic leukemia faculty. Th private. “in the classroom” Wi-Fi network for the Master Class and interactive learning systems that we use, enable all faculty and all learners to see all questions and comments and “up-vote’ those that are most important to the learners. Every faculty member and every participant in the audience sees all questions. This Leukemia Master Class affords a rare opportunity to personally meet and establish rapport with the expert academic leukemia KOLs. For example, the class of FLT-3 and other targeted therapies, CAR-T cells, and immune checkpoint inhibition for various leukemia subtypes are examples of how quickly and how dramatically the leukemia landscape has changed. At this Master Class you will hear from the distinguished academic KOL faculty on how they see the leukemia treatment paradigms continuously evolving. Almost EVERYTHING is new information. During the two days of the Leukemia Master Class, there is a one-hour welcome reception and a one-hour dinner on day one, plus several other meal functions where individual academic leukemia KOL faculty members are assigned separate tables to enable pharmaceutical, biotech and laboratory/diagnostic industry participants to sit with the leukemia KOLs of their choice: one formal dinner on day one and, two buffet breakfasts, and two buffet lunches. There are also four beverage breaks. With a limit of only 90 audience participants there is ample time for personal meetings with the leukemia KOLs. Although we cannot guarantee that all or most KOLs will attend the dinner and reception, we definitely incentivize them with extra honoraria for this purpose so that you can meet them. Most will attend the lunches on both days. We also develop the agenda to be able to attract the top-tier KOLs on the two weekdays for this Leukemia Master Class. Please note that there is zero CME industry support for our Master Classes. Therefore, we are able to attract the top-tier academic KOLs to participate in all meals, avoiding the Sunshine laws. And please also note, besides this 2018 Leukemia Master Class, there are a very limited, and few in number of opportunities for KOL and industry executive interactions. And the KOLs are just as interested in meeting you as you are meeting them. 2-day "immersion" training program on LEUKEMIA for pharmaceutical, biotech and diagnostic/laboratory executives who want a comprehensive update. There is significant new information and many new drugs for leukemia. Seating is limited. For group discounts click here steve.madison@bmli.com. The faculty on the agenda are invited. Those already confirmed are labeled as Confirmed. Day 1 - October 19, 2018 Dr. Jabbour, Dr. June, Dr. Kantarjian are Co-Chairs Confirmed. I understand how to select the optimal front-line therapy for treatment-naïve AML patients. YES? NO? UNCERTAIN? I understand when and how to use targeted therapy in the treatment of Acute Myeloid Leukemia. YES? NO? UNCERTAIN? I understand when and how to use immune therapy in the treatment of Acute Myeloid Leukemia. YES? NO? UNCERTAIN? I understand how I diagnose Ph-like ALL. YES? NO? UNCERTAIN? I understand how to use immunotherapy (inotuzumab vs blinatumomab vs CAR T-cells) in R/R ALL. YES? NO? UNCERTAIN? Treatment-Free Remission for CML Patients: Ready for Prime Time? For lower-risk MDS, I do not use upfront hypomethylating agent. YES? NO? UNCERTAIN? I do frequently rely on molecular features to decide on my treatment strategy. YES? NO? UNCERTAIN? Watch and wait is not a standard of care anymore. YES? NO? UNCERTAIN? MRD assessment is a must in our practice. YES? NO? UNCERTAIN? Assessment of Minimal Residual Disease (MRD): Should MRD be a milestone? I understand the criteria needed to make a diagnosis and to initiate therapy. YES? NO? UNCERTAIN? Early intervention is needed in patients with lower-risk disease. YES? NO? UNCERTAIN? This is a two-day, must-attend, "immersion" training program specifically designed for pharmaceutical, biotech, and laboratory/diagnostic industry executives who need a comprehensive update on the treatment of leukemia. This is a “must attend” for anyone who wants to be current and up-to-date on the treatment of leukemia, especially because the landscape has changed ALMOST TOTALLY in the past 24 months. There are so many new and emerging therapies for the management of leukemia. This is a must-attend Master Class. This Leukemia Master Class is a very comprehensive 2-day intensive review for pharmaceutical industry executives and laboratory testing/diagnostic executives who wish to be completely up-to-date on the most important leukemias that are responding with significant clinical responses to therapy. The primary objective OF THIS MASTER CLASS is to provide pharmaceutical, biotech and diagnostic/Laboratory executives with the best clinical practices to help them understand what their customers (hematologists and other HCPs) must know in order to improve outcomes in their leukemia patients. This Master Class will integrate the many new and emerging therapies into best practices for treating leukemia patients including the use of novel targeted therapies such as FLT-3 inhibitors and other targeted therapies, novel immune therapies such as checkpoint inhibitors, CAR-T cells, and novel uses of chemotherapy in various combinations with the various Systemic therapies. On behalf of the world-class faculty of expert leukemia cancer medical hematologists and oncologists, an Advanced Nurse Practitioner, and a Professor of Pharmacy, we are very pleased to invite you to attend the forthcoming two-day, multi-disciplinary CME/CE Leukemia Master Class. Participants will enjoy a highly interactive educational program. Real-life patient cases are used throughout the day addressing the application of new clinical strategies with personalized medicine for lung cancer. After two highly engaging days of learning you will have received the precise, summarized information you need to be totally up-to-date and understand how your customers—your hematologists treat their leukemia patients to improve their outcomes. You will be familiar with and equipped to handle most of the conundrums and issues you face in your business. Using Personal iPads, Tablets, Mobile Phones or other smart devices, participants will make patient management and treatment decisions involving clinical cases presented by the expert KOL ACADEMIC leukemia faculty in order to better understand how leukemia patients are treated today. Participants will also use their personal iPads, Tablets, smart MOBILE phones and other Wi-Fi-enabled devices including laptops to "answer yes or no" to questions on key topics addressing unmet medical needs. PLEASE Bring your own Smart phones, Tablets, or Laptops (iPads, Androids, iPhones, etc. ): This will enable ALL participants to use their personal smart devices during the Leukemia Master Class to ask and answer AND UP-VOTE all questions. Thank You. Despite numerous scientific and clinical advances, some being quite dramatic and practice-changing clinical strategies, many patients with leukemia will die of their malignancy. There have been astonishing clinical advances recently, but there is a long way to go to cure more patients with leukemia. This Leukemia Master Class will address the unmet medical needs so that the pharmaceutical, biotech, and diagnostic/laboratory company executives understand these from the perspectives of their customers. And simply put, because there are so many new, and continuously emerging, anti-leukemia therapies, there are numerous unmet educational needs for everyone involved. As an additional incentive for the pharmaceutical, biotech and diagnostic/laboratory company executives, this Leukemia Master Class provides 2 full days of CME,CNE and CPE credit. The Oncology Learning Center is the parent company of the BioMedical Learning Institute (BMLI) who provides the CME/CE credits. BMLI has recently received the prestigious 6-year re-accreditation, the Accreditation with Commendation status. Similarly, BMLI also has the maximum 6- year accreditation from ACPE for pharmacists and 4-years from ANCC for nurses and nurse practitioners. The target audience for this CME/CE Leukemia Master Class is primarily the pharmaceutical, biotech, laboratory/diagnostic industry executives who are involved in the area of leukemia: either in drug development or commercialization. A large and an increasing number of executives holding various medical, research, marketing, sales and other vital positions within the pharmaceutical, biotech, and laboratory/diagnostic companies involved in leukemia research and commercialization, have clinical, scientific or advanced healthcare degrees and licenses, such as NPs, oncologists, pharmacists, nurses, Nurse Practitioners, Physician assistants, PhDs, dieticians and other physicians and Health Care Professionals (HCPs) and have chosen to utilize their HCP degrees for careers within pharmaceutical, biotech and diagnostic/laboratory companies, and ancillary companies such as medical advertising and communications companies. In addition, all non-industry, HCPs in community practice settings, including hematologists, oncologists, physicians nurse, pharmacists and other HCPs, who are interested in this Leukemia Master Class activity are invited to attend and can earn up to 16 hours of CME/CE credit. And anyone else who may not be a HCP, but rather who is an important and integral member of the chain of professionals involved in the delivery of care to cancer patients are also invited to “audit this Master Class for no CME/CE credit.” This is especially true for many marketing and sales executive but it also includes consultants, and other corollary personnel involved in leukemia such as advertising executives and writers. The inclusion of everyone from various backgrounds, especially in a limited group of 90 participants, will only help to facilitate an important interactive dialogue during this two-day Leukemia Master Class. Understand the biology, prognostic factors and how to diagnose and assess the major subtypes of leukemia for developing optimal treatment strategies. Evaluate the different treatment strategies for elderly and adolescent patients in various leukemia subtypes. Understand the clinical applications of allogeneic stem cell transplantation in various leukemia subtypes. Analyze the emerging roles of checkpoint inhibition, novel targeted oral therapy, novel targeted antibody therapy, and CAR-T cells in various leukemia subtypes. Describe the major practice-changing clinical trials that are either ongoing or recently completed for the major subtypes of leukemia. Compare and contrast the current and emerging treatment strategies for patients with Acute Myeloid Leukemia (AML) up front and in the relapsed/refractory setting. Compare and contrast the current and emerging treatment strategies for patients with Acute Lymphoblastic (Lymphocytic) Leukemia (ALL) up front and in the relapsed/refractory setting. Compare and contrast the current and emerging treatment strategies for patients with Chronic Myeloid Leukemia (CML) up front and in the relapsed/refractory setting. Compare and contrast the current and emerging treatment strategies for patients with Chronic Lymphocytic Leukemia (CLL) up front and in the relapsed/refractory setting. Compare and contrast the current and emerging treatment strategies for patients with Myelodysplastic Syndrome (MDS) up front and in the relapsed/refractory setting. Compare and contrast the current and emerging treatment strategies for patients with Myeloproliferative Neoplasms (MPN) up front and in the relapsed/refractory setting. Describe the biology, prognostic factors and how to diagnose and assess the major subtypes of leukemia for developing optimal treatment strategies. Identify the different treatment strategies for elderly and adolescent patients in various leukemia subtypes. List the clinical applications of allogeneic stem cell transplantation in various leukemia subtypes. Describe the emerging roles of checkpoint inhibition, novel targeted oral therapy, novel targeted antibody therapy, and CAR-T cells in various leukemia subtypes. Recall the major practice-changing clinical trials that are either ongoing or recently completed for the major subtypes of leukemia. Describe the current and emerging treatment strategies for patients with Acute Myeloid Leukemia (AML) up front and in the relapsed/refractory setting. Describe the current and emerging treatment strategies for patients with Acute Lymphoblastic (Lymphocytic) Leukemia (ALL) up front and in the relapsed/refractory setting. Describe the current and emerging treatment strategies for patients with Chronic Myeloid Leukemia (CML) up front and in the relapsed/refractory setting. Describe the current and emerging treatment strategies for patients with Chronic Lymphocytic Leukemia (CLL) up front and in the relapsed/refractory setting. Describe the current and emerging treatment strategies for patients with Myelodysplastic Syndrome (MDS) up front and in the relapsed/refractory setting. Describe the current and emerging treatment strategies for patients with Myeloproliferative Neoplasms (MPN) up front and in the relapsed/refractory setting. This symposium provides 16 hours of CME credit to physicians, 16 hours of CNE credit to nurses, 16 hours of CPE credit to pharmacists, and a Certificate of Attendance for fellows and other HCPs for receiving 16 hours of credit from their professional organizations and accrediting societies. The BioMedical Learning Institute (BMLI) is proud to have earned the prestigious 6-year “Accreditation with Commendation” status as an elite provider of continuing medical education (CME) for physicians. The BioMedical Learning Institute is accredited by the Accreditation Council for Continuing Medical Education to provide continuing medical education for physicians. BMLI is accredited through March 2023. The BioMedical Learning Institute designates this live activity for a maximum of 16 AMA PRA Category 1 Credits™. Physicians should only claim credit commensurate with the extent of their participation in the activity. The BioMedical Learning Institute (BMLI) is proud to have earned the maximum 6-year accreditation status from the Accreditation Council for Pharmacy Education as a provider of continuing education (CPE) for physicians. BMLI is accredited through June 2023. The BioMedical Learning Institute designates this educational activity for 16 contact hours. Physician Assistants: AAPA accepts certificates of attendance for educational activities certified for Category 1 credit from AOACCME, Prescribed credit from AAFP, and AMA PRA Category 1 Credit™ from organizations accredited by ACCME or a recognized state medical society. Physician Assistants may receive a maximum of 16 hours of Category 1 credit for attending this symposium. This Cancer Master Class will be conducted at the Hyatt Regency Hotel DFW International Airport located in Terminal C which is very conveniently located inside the Dallas/Ft. Worth (DFW) International Airport. We have secured 90 sleeping rooms at a discounted room rate of $139 per night (single and double occupancy), $164 triple occupance, or $189 quadruple occupancy at the Hyatt Regency Hotel DFW. All of these discounted rates are exclusive of applicable taxes which are estimated at 13%. 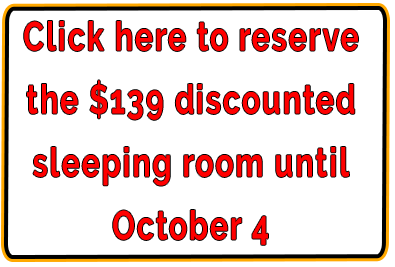 The cut-off date or last date that you can reserve a discounted sleeping room is Thursday, October 4, 2018. Click here to reserve your sleeping room. Please note #1: There are two Hyatt hotels located inside the Dallas (DFW) Ft. Worth International Airport. One is the Hyatt Regency Hotel DFW (inside Terminal C) where the Leukemia Master Class will be held and where we have reserved sleeping rooms at a special discounted rate. Detailed hotel information is provided above. Pharmaceutical, biotech and laboratory/diagnostic company executives who want a comprehensive update on leukemia; home office executives and field medical and sales staff working on either leukemia therapeutics, and/or diagnostics, testing, and also in sales and marketing positions. Developing the agenda and content for learners with varying degrees of experience in leukemia is challenging. However, for each of the previous Master Classes this has not been a problem, whatsoever. The participants for this Leukemia Master Class should have a basic understanding of the various efficacy endpoints and other measurements of efficacy. Efficacy endpoint for leukemia are different than those for solid malignancies. Also, the Master Class participants should have a basic understanding of cancer toxicities e.g., Toxicity Grades 1-4 from various targeted therapies, immune therapies and chemotherapies as well as a basic understanding of Performance Status and other common metrics related to the treatment and management of leukemia patients. If a participant needs assistance on any of these fundamental topics he/she is highly encouraged to do some self-study using the Internet and simple Google searches. This will help a participant gain a better understanding of these fundamental concepts prior to taking this Leukemia Master Class. Several past participants have reported to us that they reviewed the agenda and identified those areas where they need to do dome “extra” pre-course work. Please also note: all PowerPoint slides will be available to all participants beginning the week after the symposium is conducted. And approximately 90 days after the 2018 Leukemia Master Class is conducted (e.g., by the end of January 2019) all PowerPoint presentations and Expert Panel Discussions and Q&As will be developed into archived Webinars that will be accessible 24/7 and free of charge for one year to all paid participants. Why Take This Leukemia Master Class? Today, there is simply far too much new and emerging information on so many standards of care and leukemia therapeutics. Two years ago the leukemia landscape was significantly different for AML, CLL, ALL and other leukemias, MDS and hematologic neoplasms. And two years from now it will be very different again. This 2-Day “immersion” Leukemia Master Class is the ideal, practical and cost-effective way for anyone to become current and knowledgeable regarding the information that a pharmaceutical industry or laboratory/diagnostic company executive needs to know. This 2-Day Leukemia Master Class is also an ideal, practical and cost-effective way for anyone to get to know, personally, many of the country’s top-tier academic KOLs in leukemia. Attending this Leukemia Master Class provides participants with an important additional benefit: the opportunity to establish or strengthen personal relationships with the lung cancer KOLs while learning leukemia in an immersion, 2-day setting. This Leukemia Master Class is offered only ONCE every 24 months. No other similar leukemia immersion Master Class training course exists, especially this one that is taught by the true leukemia experts. And it also provides up to 2 days of CME, CNE and CPE credit. Within the R&D pipelines of numerous pharmaceutical companies, there is an ever-increasing number of therapeutics for leukemia. With just three examples, one can easily see the need for tis Master Class now and every 24 months. Today there are several FDA approved FLT3 inhibitors for AML, and tremendous excitement with CAR-T cell therapies recently approved only a few months ago for ALL and lymphoma. And some researchers are starting to think of CLL as a curable malignancy, almost unthinkable two years ago And numerous other anti-leukemia drugs are in late-stage clinical development. Several are expected to be approved in 2018 and 2019 or receive expanded FDA label claims such as their use in various novel combination regimens. Can you afford to miss this Leukemia Master Class if your pharmaceutical, biotech, laboratory/diagnostic company executives attend? and can you afford not to be the most competitive within your industry regarding leukemia? It is difficult to predict, but most of our Master Classes completely sell out well in advance of the date of the programs. The Master Classes are capped at 90 participants. This has two implications for registering early: 1) if you request any group discounts early, you will get larger discounts—because of supply and demand, group discounts diminish as the class fills up; 2) Also, if you wait too long you risk the possibility of being able to attend the Leukemia Master Class. As soon as 90 participants are registered, the Leukemia Master Class closes and will not be repeated until 2020. Can you afford to take the chances of losing out on the discounts or even not being able to attend?